And now finally archaeology supports the ancient historian - Pliny, in that in Old Jerusalem, long before seventeenth-century Dutch master, Johannes Vermeer's brush-stroke ever touched the canvas of 'Girl With The Pearl Earring' - that earrings made from Pearls were being worn (by at least one girl) in Jerusalem 2 000 years ago. Evidence takes the form not of stones or bones but courtesy of Pearl Jewelry! The antiquities authority in Israel state that archeologists have excavated a gold PEARL earring beneath a parking lot next to the walls of Jerusalem's old city. (Chareston Daily Mail, Thursday November 27, 2008). "Cast Not Your Pearls Before Swine" would have been well received no doubt by the Roman ladies of the time, who loved wearing extravagant jewelry. However, pagans and christians were united in their condemnation of the love of luxury exhibited by the Roman ladies. The Historian, Pliny further tells us, Lollia Paulina, Caligula's wife, at anordinary function, wore emeralds and pearls on her head, hair, ears, neck, arms and fingers! Pliny further states, that women, wore, two or three pearls in their ears so that they "rattled". Pearls were highly esteemed in the Holy Land even back in Ancient Jerusalem, and we have the proverb "Cast Not Your Pearls Before Swine" to thank for this little kernel of truth, (or pearl of wisdom ;-) that proves pearls not only were in circulation in the Holy Land 2000 years ago, but they were "rattling" from ear lobes! 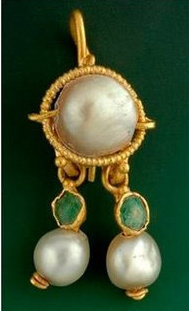 The excavated ancient pearl earring, you can see in the above image on this page is the physical cold, hard evidence! It's hard to imagine that any type of pearl, especially a Natural pearl, which is mainly all nacre, could survive this long, but archaeology proves that Natural pearls of lasting quality, can indeed survive over this great time-span. The antiquities authority in Israel say that archeologists have excavated a gold PEARL earring beneath a parking lot next to the walls of Jerusalem's old city. (Chareston Daily Mail, Thursday November 27, 2008). The earring was discovered during an excavation of the ruins of a building from the Byzantine period, dating from between the 1st-4th century, A.D. The authorities also say, the earring is inlaid with NATURAL PEARLS and emeralds and would have been made between the first century B.C. and the beginning of the fourth century A.D.
Natural Pearls are rare and valuable and pearls from the Persian Gulf Pearls most likely where the pearl earring originated, recovered recently, are still available for purchase today. Click Here to purchase a strand of natural Persian Gulf pearls with an authentication certificate included. Very few matched strands of Natural Pearls even exist. Those that do often sell for hundreds of thousands of dollars. They are either sold singularly as a collector's item, or set as centerpieces in unique jewelry. Wearing Gucci and driving a Mercedes may be well and good but nothing compared to owning a strand of Natural Pearls. Besides x-ray examination the best tests, that I've found that will help you identify between natural and cultured making identifcation fairly easy can be found here. Moral of the story ladies, is not to hide your pearls away in jewelry boxes- it's tantamount to casting pearls before swine- take your pearls out tonight and put them to their original purpose - to highlight a woman's natural beauty. From the list of gemstones, Pearls like Opals need special consideration and jewelry storage. All types of of pearls, except Pearl Imitations require moisture and therefore storing pearls in a safety deposit box over long periods of time is definitely not recommended. Whether you have a strand of Mikimoto pearls, or are fortunate to own Natural Pearls, one of the best ways to care for pearls and keep them in the best condition is to actually wear them. Your skin's natural oils will help to keep them lustrous and in good condition. It's a fact, long before Kokichi Mikimoto marketed Cultured pearls, pearl farming goes back to ancient times. Natural marine pearls, were called "orients" by the old-timers, and have always been highly prized. This is due to a number of factors which include, rarity, beauty, supply and demand. And when the demand exceeds supply then the price goes up. It's little wonder natural born pearls are referred to as the 'gem of queens' and the' queen of gems'. The Old proverb cast-not-your-pearls-before-swine is further evidence of just how much pearls have always been valued. 1. That pearls CAN survive 2,000 years, although not highly ranked on the Mohs scale of hardness. 2. Once upon a time in Jerusalem, lived a girl with a pearl earring. From old information on pearls, we know, that the best quality pearls are found in the Persian Gulf - most probably the 2,000 year old pearl earring, the archaeologists unearthed in Jerusalem, November 2008, was a Persian/Arabian Gulf Pearl. Higgins, R., Greek & Roman Jewellery, University of California Press, Berkley & Los Angeles, 1961.